YES, HE WAS an artist — an American Master, at that — but, for those who were lucky enough to know him “up front and personal”, they know that Will was much, much more than that soft-spoken, elderly gentleman recently honored by the President in Washington, D.C. I was one of the lucky ones to get “up front” and personal with Will — first, back in early 1987, when I interviewed him at his studio at The National Arts Club (his Profile appeared in our pages in July, 1987), that initial occasion leading to many other one-on-one conversations over the years. In fact, it was only shortly after my first meeting with him at The Arts Club, that he proposed me as a member, an association that had proven to be a boon for many years. 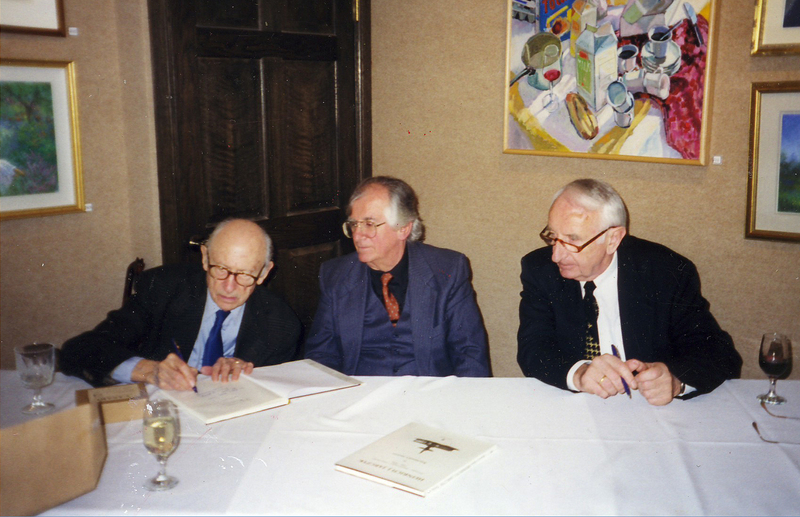 It was through Will that I first met fellow members Everett Raymond (“Ray”) Kinstler and Chen Chi, both of whom would also become “Profilees” in ART TIMES (Kinstler in 1988 and Chi in 1989). Yes, being a friend of Will’s was a rich experience for sure. When I was asked by Rosina Florio, late Director of the Art Students League of New York, to write an “anecdotal” history of that famous school (she “absolutely” did not want a “dry as dust” narration), Will was one of the people she directed me to interview for “some great anecdotes”. A teacher at the League for some 50 years (he also did stints at Cooper Union, Yale, the Pennsylvania Academy of Fine Arts, among others), Will graciously invited me to his daughter’s home up in Maine for an afternoon’s “chat” where he regaled me with one League story after another, and more. We somehow got around to talking about the “artworld” in general, and, in particular, art criticism. I asked him how (and when) he thought art critics managed to get such “clout” in present days, given that image-making predated written language (the ‘stuff’ of today’s critics) by thousands of years (Georgio Vasari ((1511-1574)), incidentally, is usually given credit for being the first bona fide art critic). Will did a little frowning and mind-cudgeling and finally looked up and said: “One word is worth a thousand pictures.” “Wha’?” I managed. It was the first time I’d ever heard that old saw turned on its head like that, but he soon explained (Will was nothing if not erudite and able to hold his own in displaying his considerable knowledge about art and its history). “This country was pretty illiterate back in the day, but after World War II, that all changed — many dischargees, unwilling to go back to farms, factories, and ditch-digging, opted for college when they found out the Government would help, so, almost overnight, America’s literacy rate boomed. Women, of course, followed in their male’s footsteps and, lo and behold, the written word became almost sacrosanct…trouble was, however, that though people learned to read, few ever learned how to read art. So, they depended on the word to clue them in on anything they didn’t understand — including — you might say especially — the arts. They turned to the pundits for guidance — what book should I read, what music should I listen to, what movie should I go see — which artist’s work is worthwhile taking up time to stand around and look at? Enter the critic. So, like I said, ‘One word is worth a thousand pictures’. It doesn’t matter if you have a thousand paintings stacked up in your studio unless some critic gives the ‘word’. So, the public figures that if an artist is being written about, well then, he must be worth seeing. It’s gotten to the point now, that people are more willing to believe what some pundit saysthan what some artist creates. In fact, they don’t trust their own eyes, their own judgment about what’s ‘good’ or ‘bad’. They only trust what they read about an artist. And that’s a shame! Ever go into the Met and see how people ‘look’ at art? They look through their ears and not their eyes.” A shrug and a long sigh. I certainly got the point – for sure, he taught me how to be a better critic, a better artwriter, and to be wary about my judgments. In addition to being a good friend, he was a teacher — and I’ll never forget how much he taught me. Indeed, he went even further to help me along the way, even contributing his thoughts on printmaking for my book on the Cologne-based etcher, Heinrich J. Jarczyk— after having invited me and the artist to his studio where I taped the interview before publication. And, as for his own work, he never slowed down, never stopped learning about his craft (still so obvious when I reviewed his show at the Alexandra Gallery in June of 2002). I’m sure there are a great many “out there” who can contribute their own personal thoughts and memories — the “official” laudatory obituaries have already hit the presses and delivered to the public. Believe me, they only tell part of the story. You are currently browsing the Raymond J. Steiner's Blog blog archives for November, 2012.